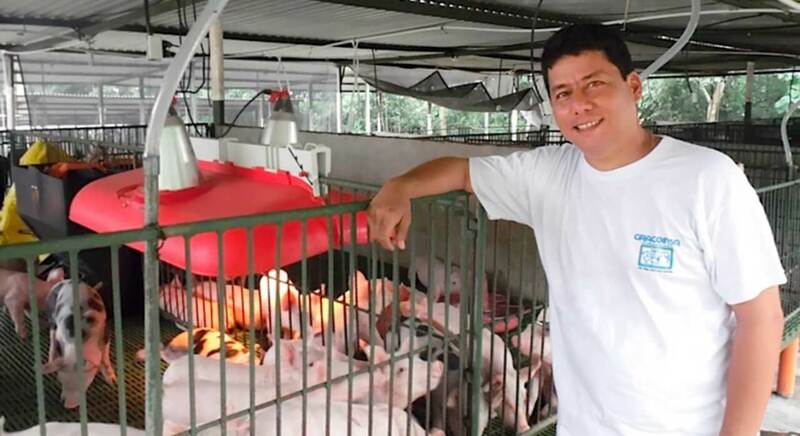 "Coming from a family with a long tradition of cattle farming and with working experience on pig farms, Hugo Siliezar from Guatemala's first business initiative was a fish farm dedicated to the production of tilapia fingerlings. With this project running, in 2000 Hugo and his wife decided to expand the business and, given their experience, they decided to build a hog farm, and started work with 10 sows and one boar, the aim being to sell the pigs they produced. With time and good market conditions, they decided to expand the operation, and they currently have 255 sows and a farrow-to-finish operation, where 100% of piglets are fattened for sale as cereal-fed pigs. - How is the farm distributed? The farm is divided into three production sites. At site 1, we concentrate the work with gestation and farrowing. So, in gestation, we have two early gestation barns (1 to 42 days) and two late gestation barns (from 43 to 107 days), as well as a stimulus barn for gilts and empty sows. In farrowing, we have five barns with the capacity for 12 sows each, where we wean at 21 days, which leaves us a week for depopulation. Finally, at site 1 we also have a laboratory for the preparation of the weekly rations and an area for boars. At site 2, we have two weaning barns with the capacity for up to four weeks of age each. Each week consists of 8 pens of 15 pigs, which are kept in these barns from week 4 to 10, so that also includes a week for depopulation. Finally, at site 3 we have 10 barns that are divided into 96 pens with the capacity for 15 animals each. The operation also has a 6-pen quarantine zone for 5 sows each, an office area, laundry room, dining room, bathrooms, and we have the fish farm on the same premises. 100% of the equipment that we use on the farm is made by Rotecna, which we have acquired from the outset through its distributor in Guatemala, Gracoinsa, who more than business partners, are viewed as friends. - Why did you decide to buy Rotecna products? The proven quality of Rotecna products, which is basically resistance and efficiency, is why we have always bought their products and all the expansions of our facilities have been done with the same brand, incorporating the different equipment, which is constantly improving and innovating. - Which products would you highlight? It is very difficult to single out any, because all of them, in their respective sections, have fulfilled their tasks excellently. I could highlight the Swing R3 fattening hopper, which has given us very good results, since it reduces wastage of feed and encourages animals to consume thanks to its water system, which has helped us to obtain better results in terms of daily weight gain. So, we are managing to reduce the number of days until they come out of fattening with the same weight. And then, the plastic slats have shown their huge quality in terms of durability, as have the sow pans, which we also have installed in the boar area, as they help with diet and ensure good hygiene. - You have a Rotecna Ni-2 on your premises. What benefits has it brought? The Ni-2 are the latest product we've bought. We are very happy with the results, which can be quantified as a reduction by almost 2% in pre-weaning mortality. The biggest advantage that I have found with the Ni-2 is how manageable it is between farrowing pens and barns. They also make cleaning a lot easier, so the farmhands are happy and comfortable working with this system. Personally, from the very beginning I have really liked the comfort that the Ni-2 provides to the piglets. - How do you use the Ni-2 to get the best performance out of it? In farrowing pens, we use it in the first two weeks of life of our piglets to ensure their comfort and reduce mortality. Then in weaning we have a barn equipped with Ni-2 so that the piglet don't suffer increased stress due to the lack of heat. - What are the biggest challenges for the Guatemalan pig industry? Given the growing demand for pork, the challenge is to maintain healthy production levels, to efficiently provide for domestic consumption. - And as a farmer, what are your future goals? 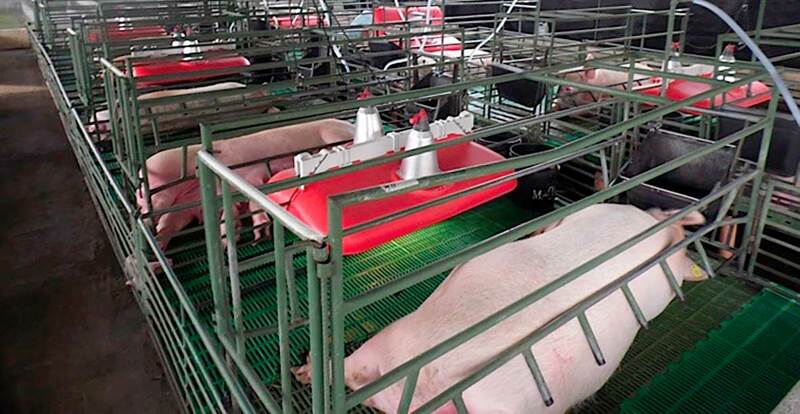 At the moment, after reaching the maximum number of productive sows, my aim is to make the unit as efficient as possible in order to face up to new times. I am also thinking of starting to work with another species of livestock to diversify production."